This weekender duffle bag is made from 600 denier polyester and has a large zippered main compartment for sport or weekend wear. Two zippered front pockets for accessories and padded handle wrap and adjustable non-slip shoulder strap. 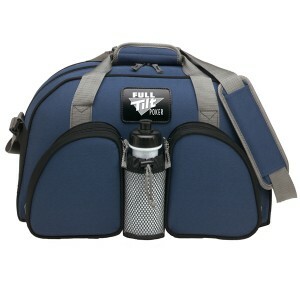 Front mesh pocket for water bottle or accessories and permanent hard bottom. Bottle not included. 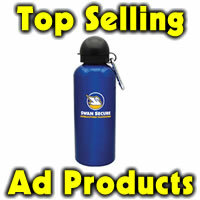 Great company gift or sports team gift. Min is 20 9.98. Set up is 62.50 per location. Imprint or deboss on the patch or imprint on either pocket or embroidered on one or both pockets. Embroidery set up 10.00 per 1000 stitches. Item AG-223. Comes in navy, black, red, lime, purple, orange, yellow, forest, kelly green, pink or royal.